Can You Love Too Much? Codependent "Caretakers"
The conventional belief is that we can never love too much, but that isn’t always true. Sometimes, love can blind us so that we deny painful truths. We might believe broken promises and continue to excuse someone’s abuse or rejection. We may empathize with them but not enough with ourselves. If we grew up in a troubled environment, we might confuse our pain with love. Although relationships have disappointments and conflicts, love isn’t supposed to be painful and hurt so much. As codependents, we have a habit of ignoring our needs and constantly putting those of others first. We end up self-sacrificing. By not having boundaries, we harm ourselves and the relationship. We might also confuse love with being someone’s caretaker. Parental love is expected to be unconditional and one-sided toward their young children. As they grow, good parenting includes mutual respect for each others’ boundaries. Caregiving is a normal outgrowth of love and is also part of healthy adult relationships. When someone we love is in need, we naturally want to help. 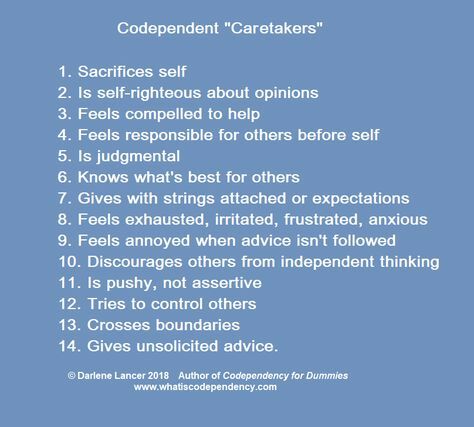 Yet there’s a difference between “caregiving” and codependent “caretaking.” In the latter situation, we might care for someone in a manner that is intrusive or enabling. We do harm to the other person and risk sacrificing our own lives in the process. With codependent caretaking, often there’s more “taking” than giving. The caretaker’s objectives can subtlety take precedence. This is because caregiving comes from abundance, and caretaking emanates from need and deprivation. Caretaking can become so habitual that it enables and disables the recipient so that he or she doesn’t take responsibility for his or her behavior and needs. It treats that person like a child who doesn’t have to grow up and reinforces his or her lack of confidence. Again, due to the lack of boundaries, caretaking eventually negatively impacts the relationship as a whole. 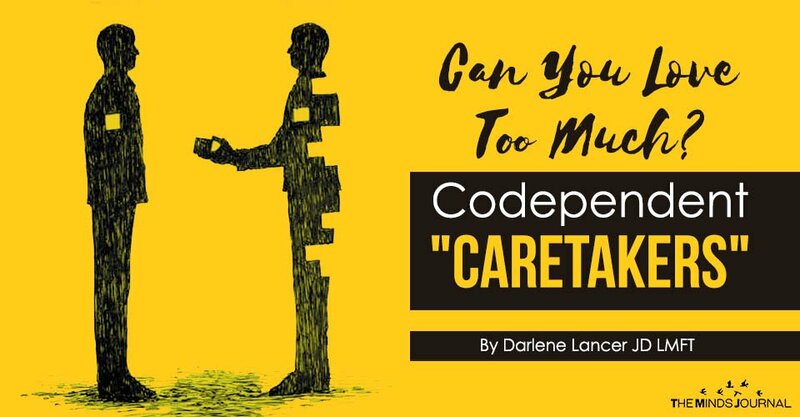 When one partner acts as a caretaker of the other, it creates an imbalance and unhealthy mutual dependency – codependence. 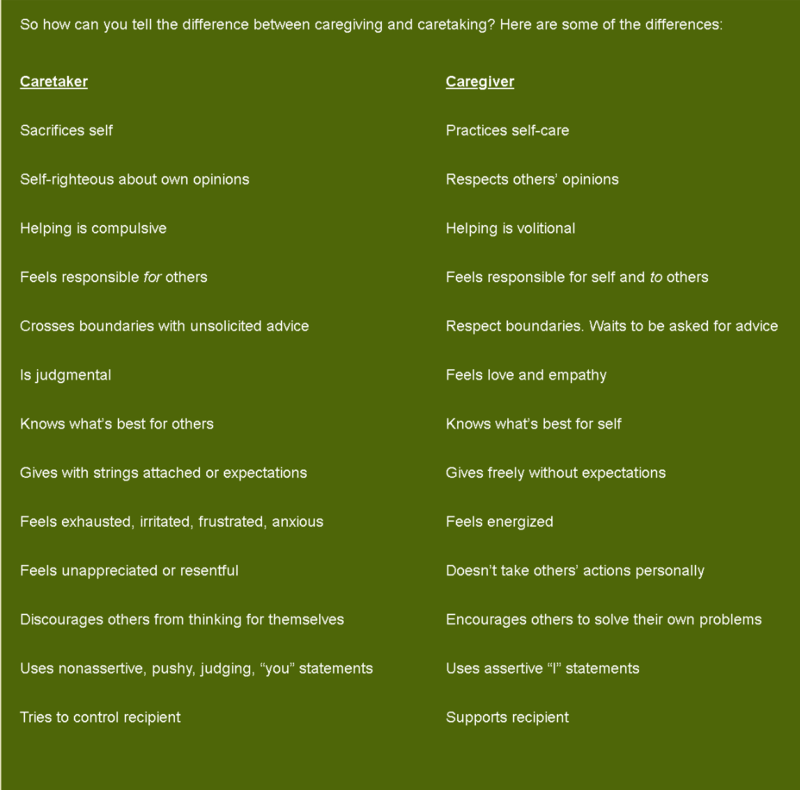 The caretaker doesn’t have to be as vulnerable as his or her partner. The caretaker feels needed and superior and at the same time is assured that his or her partner won’t leave. Over time, both end up feeling guilty and angry. The more a caretaker becomes invested in the problems of his or her partner, the more that advice and control characterize the dynamic between them. What may have started out as an act of love devolves into resentment when well-meaning advice or wisdom isn’t followed. Do you judge your partner? Do you believe that you know what’s best? Do you repeatedly do things for your partner that he or she is capable of doing? Does your partner meet your needs? Do you feel responsible for your partner’s negative feelings? Do you feel guilty saying “no” to your partner? Do your partner’s problems preoccupy your thoughts? Can you listen without giving advice? Do you get upset if your advice isn’t followed? Do you give with strings attached? Is it uncomfortable to listen to another’s problem and not offer solutions – even when asked? I found this very helpful? I have had people try to behave in a similar way with me in the past, and I broke ties with them quickly as I found it toxic and destructive. Do you have any information regarding those who are on the other side of the codependent relationship?